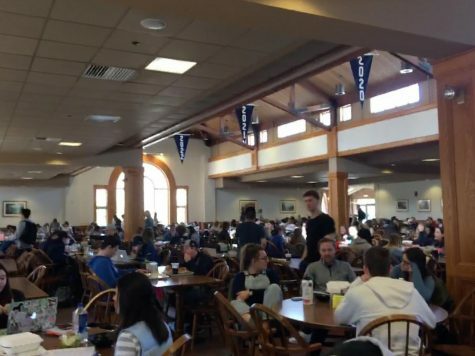 As Saint Anselm students left for spring break, prepared to relax and enjoy themselves, a handful of students dedicated their free time to service. SBA, or Spring Break Alternative, are mission trips overseen by the Campus Ministry that enable students to live and learn the Catholic social teaching of giving back to one’s community. Students spend time living and working closely with those in need all around the country. Destinations vary from working in a town’s local soup kitchen, renovating homes, or tutoring children. Each trip has a different message to be portrayed. Those who went to Pine Ridge, South Dakota, explored cultural immersion and advocacy through Re-Member. Re-Member is a nonprofit organization that works closely the with Oglala Lakota Nation on the Pine Ridge Native American Reservation, whose goal is to improve the quality of life through volunteering and relationships. Sophomore Michael Botsch went on his second service trip with Saint A’s this spring break to Orland, Maine to volunteer at Homeowners Organized for More Employment (H.O.M.E. ), an organization that assists homeless folks search for employment, homes, and other assistance. It was SAC’s 29th year volunteering at H.O.M.E., making it the oldest of the Service and Solidarity trips. The volunteers were exposed to the realities of poverty and worked on helping each other toward self-sufficiency. Botsch and the volunteers that accompanied him assisted the community of Orland with various rebuilding projects, as well as cutting wood to heat the campus completely fueled by wood fires. Another student, Nicolette Theroux (‘19), went on her first SBA trip this March to Newark, New Jersey. Her and her group volunteered at Saint Benedict Preparatory School, founded by St. Mary’s Abbey. This all-boys inner-city school, Theroux says, values leadership, community, respect, and holding each other accountable. The group followed the boys throughout their day from class, to lunch, to homework help after classes. Not only this, but there was also lots of time for games, bonding, and karaoke.